That was lots of fun. I reached my goals of getting a King Beard and posting every day. I met a lot of great people and saw a lot of great photos. Thanks @Mackle for creating this crazy site. Thanks to everybody that ever king'd, fav'd, and commented on my pictures. I'll be baby-faced by March 5th, because I have a job interview for a promotion with Whole Foods. That same day, I'm going to the Back to the Future 25th Anniversary Cast Reunion in Florence, Alabama dressed as Marty McFly. He didn't have a beard in 1985 (or 2015, or 1985A, or even 1885). W0000, 'grats on the 100% photo posting. Perfect attendance and a KB. Money. you are one of the nicest guys. It was wonderful growing and showing with you @RyRy. i love everything you said in your caption. Good luck on the interview. you really should have @timbo come and sit in on it and give you a customer recommendation. Back to the Future reunion = awesome. I know Timbo is going to miss seeing you on here. Best of luck with your job interview. I've never, ever had the never to say that Back To the Future could have been better in any way, but I'm going to go out on a limb here and say that #3 would have been better if Marty had grown a beard in 1885. Good work this year, and congrats on perfect attendance and KB! Hope to see you soon, and good luck on the interview. you didn't reach on goal.... the goal of having @timbo in your photo. you serioulsly need to have him talk to the epoeple in your interview before you go in...you'd definately get the promotion then. thanks for bearding.. it was fun. You are a pimp. A legendary pimp. Someday you'll own this town. Great to know you. You are Hipstamatic. That King you got was such a great pic, it's been fun following you sir, hope our paths cross again soon in Nashvegas, cheers! farewell sir. as a regular whole food shopper, i hope to see you more often. RyRy! My short brotha, it was great meeting you at the Throwdown. Keep in touch! Perfect atendance gold star! It was a pleasure growing with you. Awesome! You killed it here. Best of luck on the job interview. @RyRy Congratulations on the KB! well deserved! I wish you luck with the interview!!! have great fun!! Bye bye & bearded love! What a feat. All the best. congratulations on completing the marathon! farewell! Accomplished goals are the best! You've done awesomely this year, and it was great meeting you! It has been a blast man. I don't think I will ever forget your PEZ collection. 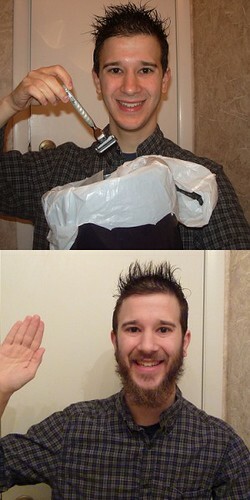 You are a legend of beards. Hope to see you with a Moustache in May. Heh, you will make a great Marty McFly! I could say a lot about what is good about your presence on Whiskerino, but most of all, your PEZ collection is completely awesome. I remember meeting you at the throwdown too, and talking about your teen wolf tee. You really do love the 80's eh? Its all great stuff. It was fun growing and showing with you. take care. dude, it's been a blast following your shot's for the last few months. I don't think I will ever see another pez without thinking of your Collection Day shot. Thanks for being awesome. It's been a pleasure. I'm not sure I've ever commented on one of your pictures before, but you seem fun and I think we'd get along. Cheers. Goodnight, and I hope you eat a delicious breakfast. It's been great sharing this with you! Such a blast! Hope we get to hang again soon! yeah team attendance, way to go! and good luck with the interview! yeah... it's kind of wierd. I've been told i'm intimidating many times before.. My last girlfriend all her freinds really liked me but i really intimidated all of them. Also there just wasn't enough time at the throwdown...but alas we still had one of the greatest photos ever with that stupid chick who wanted to take photos with a bunch of beards. The best part of today is going through calendars and not missing out on some of your gems (like Photoshop Friday). Take care and thanks for sharing! Man, that pub quiz was messed up. It's like taking a good idea and then making it complicated... I still don't know how those points worked. thanks for being here and being part of the experience. your PEZ collection is awe inspiring to say the least. from one ryan to another, take care and be well. It was fun sharing this experience with you. While I'm an idiot and screwed up the lunch recommendation you gave up (I thought you said Zola instead of Yolo) it lead us to a great lunch at Bread and Company, which I fully credit to you. I hope you get the promotion, and enjoy being Marty for a day. 29 year old, PEZ collecting, natural grocery store working, bad Jew.